At the pep-rally of the 2000 year,Bill Clinton (still enraged and bitter at his defeat at the hands of Seymour for the WWF belt in 99), interrupted Seymour�s speech with the threat and promise for defeat by an older, yet �far superior� eagle. As Seymour was dispatching the wily Clinton... Seyless appeared from behind with a metal pan, bashing Seymour across the face with the cold unforgiving metal pan; Sending Seymour crashing to the ground! This was the first time the students ever encountered the �Dark Eagle.� But it was far from their last encounter. Seymour got his revenge by utterly shaming Seyless the next day on the football field in a battle for the giant Gold Rush NUGGET. But Seyless� defeat only served to focus his hatred for Seymour, and fuel the flames of his vengeance! There has been a constant violent exchange and fierce competition between the two since Clinton�s introduction. 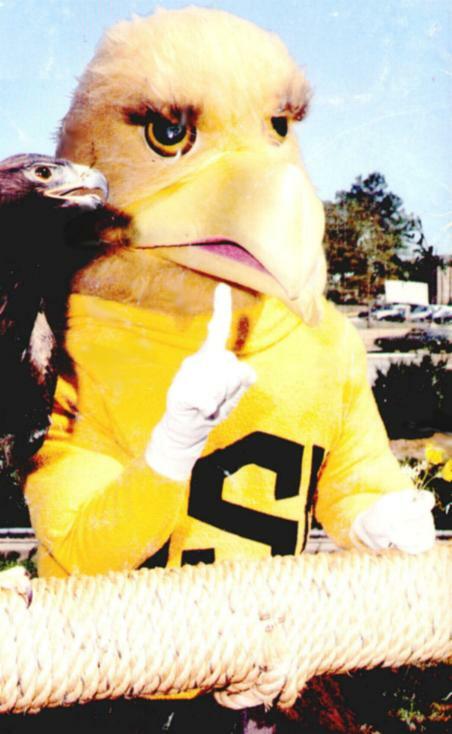 Each eagle, having a great vehemence to be the one true school mascot, refused to give an inch in the vicious struggle for loyalty from the world�s greatest fans � the Southern Miss fans. Seymour, struggling to maintain his reign as �The most electrifying mascot in college sports today!� Seyless, fighting tooth and nail to regain his seat as mascot of the greatest school in the world. Each with things toprove - will stop at nothing to entertain the masses of fans at the Rock! Both eagles stand to gain everything, but the price of loss by either is unfathomable! But the real questions lie in Seyless� corner� Just who is this Dark horse eagle? What is his true connection to Clinton and Seymour? How deep does his connections in Southern Miss go? What are his ultimate goals? And has he been just toying with Seymour all this time, waiting for the perfect moment to strike and destroy him? Will Seymour somehow manageto fend off Seyless� relentless attacks, and maintain his benevolent reign over Southern Miss? Or will Seyless� master plan come to fruition;forever changing the face of the school that ended his career? Only Time will tell who will emerge victorious in the �War for the Black and Gold�.